In 1991, a senior British official remarked to me at a reception on the lawn of the British embassy in Beijing that talks with the Chinese about human rights were simply "froth". The adviser was Sir Percy Cradock, a former British ambassador to China. He was at the time senior foreign policy adviser to the Prime Minister John Major who was visiting Beijing to discuss Hong Kong. Sir Percy's view, often expressed though not always so pithily, was that it is far more important to develop your strategic interests with China than trying to pin the Chinese down on human rights, over which you have very limited influence. That view, give or take a few exceptions, has prevailed in Western diplomacy since President Nixon went to China in 1972 and ended the isolation of the People's Republic. The Chinese republic endures but is very changed and is now a superpower in trade and a growing power in diplomacy. The need for a strategic relationship with China is even more important than ever. The British Foreign Office climate change negotiator John Ashton once said that without China, everyone else's efforts to combat global warming would be useless. China itself argues that the human rights of its 1.3 billion people are being met by its economic development, which has seen standards of living rise tremendously. Economic success has dampened to a point of dormancy the democratic movement that was crushed in Tiananmen Square in 1989. But Western governments are under pressure from human rights groups, who argue that these issues are being downplayed too much. There is a formula these days in which a visitor can talk about it, but does not get very far. Human rights are a whispered third point after trade and diplomacy. On his visit, the British Prime Minister Gordon Brown is raising the issue in general terms only, his officials have said. They say that more specific points are discussed in a government to government group the UK-China Human Rights Dialogue. The last meeting, in February last year, included a discussion on the role of defence lawyers in criminal trials. The French President Nicolas Sarkozy, who came away from China recently with a bumper order book for nuclear power stations and aircraft, concentrated on the environment and China's role in world trade, not human rights. The German Chancellor Angela Merkel is an exception. 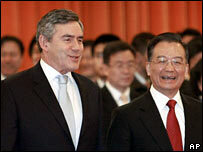 In 2006, she made a point of pressing the Chinese in talks and made this public afterwards. Steve Ballinger of Amnesty International in London told me: "There is definitely a danger that criticism of Chinese human rights will be muted now that China is an economic superpower. "Human rights are a whispered third point after trade and diplomacy. "The international community needs to press China to change and to honour its comment to 'enhance human rights' that it gave when it was awarded the Olympics." Amnesty sent Mr Brown a letter listing four areas of concern - the death penalty, detention without a fair trial, persecution of campaigners and freedom of expression. "Many internet sites in China are blocked, Amnesty International among them," said Steve Ballinger. "If you look up Tiananmen Square, you will not see the man standing in front of a tank. The international service providers should not co-operate with China as long as it is filtering searches."